Make your way to Dublin airport and check-in for Turkish Airlines flight to Tel Aviv via Istanbul, with onboard catering and personal entertainment on one of Europe's best Airlines. 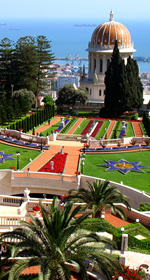 On Arrival in Tel Aviv you will be met by our Marian Pilgrimages representative and guide in the arrival hall before boarding your tour coach. Get acquainted with the group on your transfer to shores of the Sea of Galilee where we check into the brand new 4 star Sea of Galilee Hotel for 4 nights with dinner and breakfast. After breakfast we will drive to Nazareth the city where Jesus lived as a child. Here we will celebrate Mass in the Basilica of the Annunciation. Visiting the lower level of the Basilica we see the remains of Mary�s house and where the Angel Gabriel visited her. Here inscribed on the alter are the Latin words of �Here the Word was made flesh�. Adjacent to the Basilica is the St. Joseph Church, we visit the site of Joseph�s work shop and the house of the Holy Family. A short walk from the Basilica is Mary�s Well here you have the opportunity to draw water from the same well as the Virgin Mary. After some time for lunch we take the short coach journey to Cana. 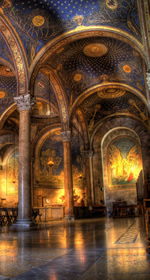 Here we visit the Wedding Church, the site of Jesus� first miracle, turning the water to wine. Couples on the pilgrimage can take part in the special ceremony to renew their Wedding Vows. In the lower level of the church we see artifacts from the site before having an opportunity to taste and purchase some wine from this sacred site. Return to Nazareth for dinner in our hotel. After breakfast we drive to Mount Tabor and ascend by taxi for Mass at the church of the Transfiguration where Jesus is transfigured and speaks to Moses and Elijah. Enjoy the view of the Valley of Armageddon before driving to Yardinet - Baptism site on the River Jordan, here we can renew our Baptismal Vows. Return to the hotel for some free time to relax before dinner. This morning we leave Galiee and drive south along the Jordan Valley into Jericho. Here we can see the Mount of Temptation where Jesus was tempted by the devil, and the Sycamore tree of Zacchaeus. Continue to the Dead Sea � the lowest place on Earth and enjoy a �dip� near Qumran, where the Dead Sea Scrolls were found. Drive by the Inn of the Good Samaritan, to Bethany to celebrate Mass and visit the tomb of Lazarus. 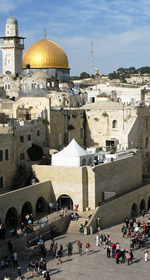 Continue on to Bethlehem where we check-in to the 4 star Grand Park Hotel, located just a stone�s throw from the Church of the Nativity in Bethlehem for 4 nights, with breakfast and dinner.